Winter Carnival was started by the Steamboat Springs Winter Sports Club (SSWSC) as a way to help residents cope with cabin fever during the height of the Colorado winter season. The event continues to this day as a way to celebrate winter; as a reason for neighbors to gather; and as an opportunity for everyone to experience a piece of Ski Town USA® history and tradition. Approximately 150 individuals from the community volunteer their time, energy, and horses to participate in the street events. The horse events truly create the excitement surrounding the street events. The horse riders play a crucial role in making the street events a thrilling spectator event, and the efforts of all of the horse riders in preparing the horses for the events are greatly appreciated. In order to participate in the street events, the horses must be specially shod with cleats for traction in the snow. In addition, it takes an exceptional horse with lots of training to feel comfortable around crowds of people. Special thanks to our long time Routt County families who ride in the street events each year: the Wilhelms with three generations of riders, the Yeagers with three generations of riders, the Uries, the Duncans, the Wheelers and the Garcias. We couldn't do this event without you! In past years, the penalty for being caught without a carnival button was to push a peanut down Lincoln Ave with your nose. The first jumping hill in Steamboat Springs was Woodchuck Hill which is currently where Colorado Mountain College stands. The Steamboat Springs High School Band has marched down the street on skis playing for the spectators of the Winter Carnival Parade for 71 Years. It first started in 1935 by band conductor Jerry McGuare. The Steamboat Springs High School Band was the first band ever to march on skis. How does all that snow get on Lincoln Avenue? Thanks to the City Public Works department who coordinates the stockpiling of snow and covers Lincoln Ave by 6am on Saturday and Sunday of event weekend each year. 400 plus tons of snow are used to cover the streets. And yes, they cover the streets and clean it up for each day of the street events. Special thanks to our Public Works Department! Saturday and Sunday highlight the event with the Winter Carnival Street Events and the Night Show Extravaganza. 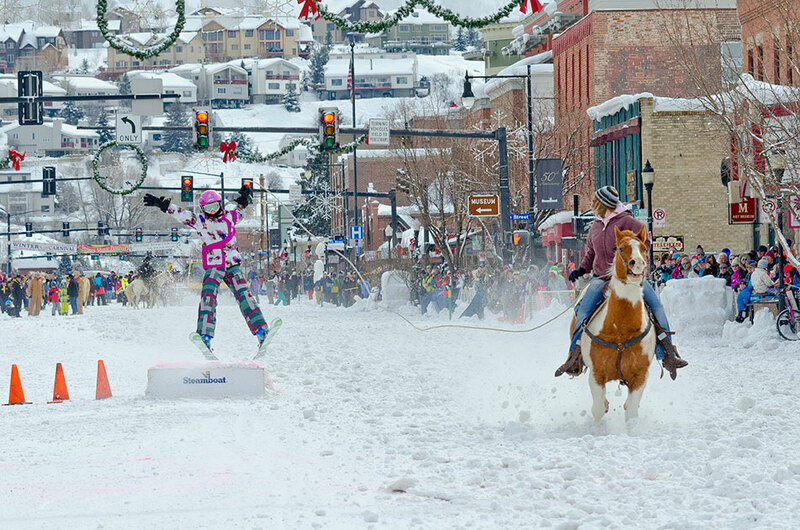 The Street Events feature local Steamboat Springs Winter Sports Club kids being pulled on skis behind horses right down main street in downtown Steamboat. A crowd favorite, the "Donkey Jump", sends kids soaring off a jump for up to 40, or even 50 feet. The last down the mountain is always the twinkle light wrapped Lighted Man with roman candles shooting out of his backpack, which makes for a spectacular opening act for the fireworks show to close out the night. 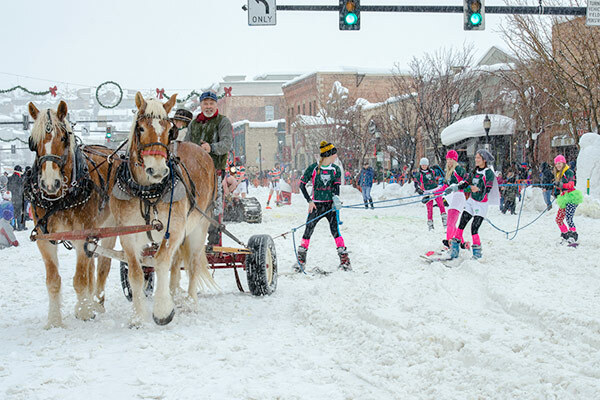 Visit steamboatwintercarnival.com to view the complete event schedule.